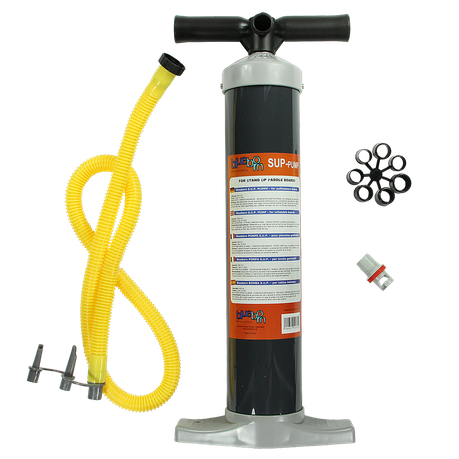 Buy Blueborn SUP Pump 1 bar - SUP high-pressure air pump for high-pressure valves of stand up paddle boards from Blueborn at Camping Outdoor online. Reliably pumps up boats, kayaks, pools and much more. Thanks to its simple manual operation, the high-pressure pump is immediately ready for use and perfect for use away from all power sources. The double stroke function generates an air flow during upward and downward movement. This means that the pump achieves the desired performance twice as fast as a conventional floor pump. The scope of delivery includes four different adapters, including one suitable for high-pressure valves. You can inflate boats with up to 1 bar (14.5 PSI). This makes you flexible and allows you to use the camping pump for various inflatable articles. In no time at all articles such as inflatable mounts, air mattresses, air beds, pools, paddling pools, toys, boats or similar can be inflated easily. In addition, the pump accessories are supplemented by a packing bag. The pump and your accessories are always safely stored and can be taken anywhere. 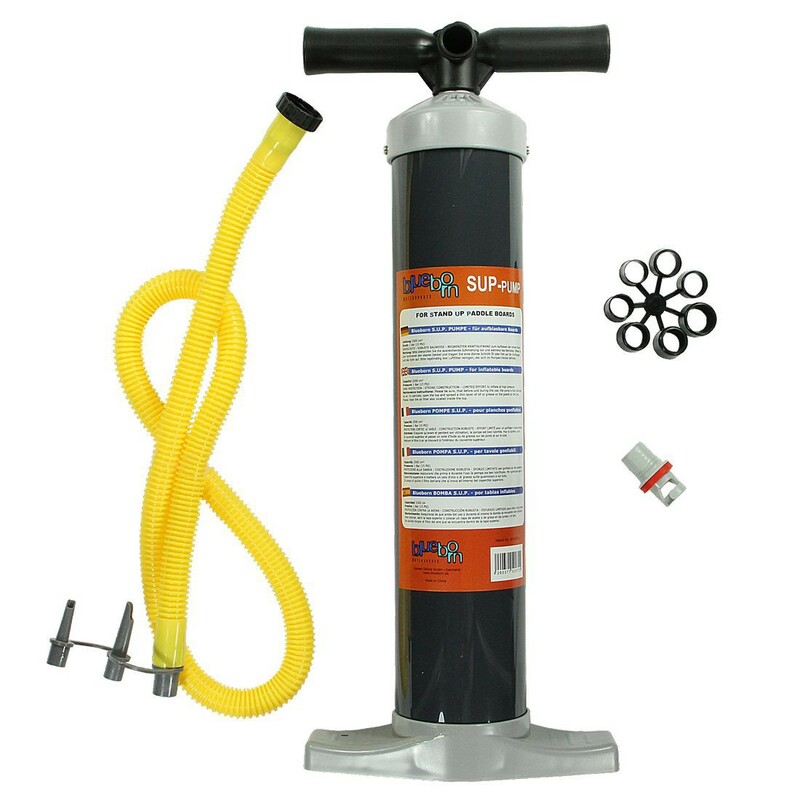 This handy pump is a must for camping or leisure equipment. Four different attachments are included in the scope of delivery, allowing you to pump up all kinds of inflatable items such as pools, air mattresses, water toys and much more. The pump is also ideal for boats, kayaks, SUPS and canoes, as it is supplied with an attachment for high-pressure valves. 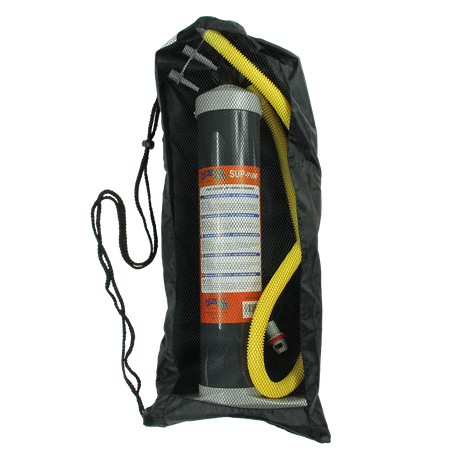 To ensure that the pump and its accessories are always safely stored, the air pump is supplied with a practical packing bag. The set is easy to transport and can be taken anywhere. The particularly flexible air hose of the piston pump can be easily unscrewed from the pump. This ensures that the pump takes up even less space in the pack bag. 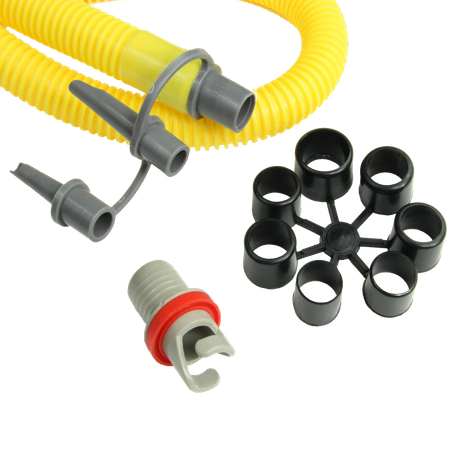 On the other side of the hose, the four attachments supplied can be attached. The large stand made of hard-wearing aluminium ensures high stability of the pump. This way you can safely park your feet and quickly pump air into your air mattress or boat with little effort. The pump with 1 bar / 14.5 psi is immediately ready for use and perfect for use away from all power sources, unlike an electric pump you are not dependent on an electrical outlet. Included in delivery are adapters for high pressure valves, Boston valves and pinch valves. Thanks to the different attachments you are flexible and can inflate SUPs, boats and much more. To avoid overpressure, we recommend the Blueborn pressure gauge SP 90 SUP as an accessory. It is very light with 100 g and can be stowed with a small packing size of 50x22x11 cm space-saving. The double stroke function generates an air flow during both upward and downward movement. The piston pump has a handle and a practical footrest made of robust plastic. 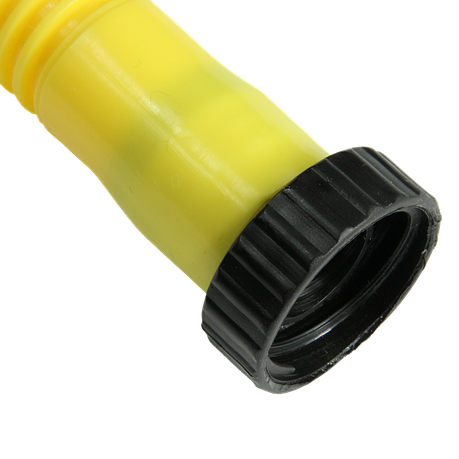 The ABS plastic used for the pump and the stable foot are extremely robust and hard-wearing. Thanks to the choice of high-quality materials, the pump is particularly durable and resilient.